YOUR QUAKES ARE CAL LEAGUE CHAMPIONS! Rancho Cucamonga, CA - For the third time in team history, the Rancho Cucamonga Quakes are California League Champions. The Quakes completed a three-game sweep on Friday night in front of more than 2,400 fans, defeating the Visalia Rawhide by a score of 9-1 at LoanMart Field. 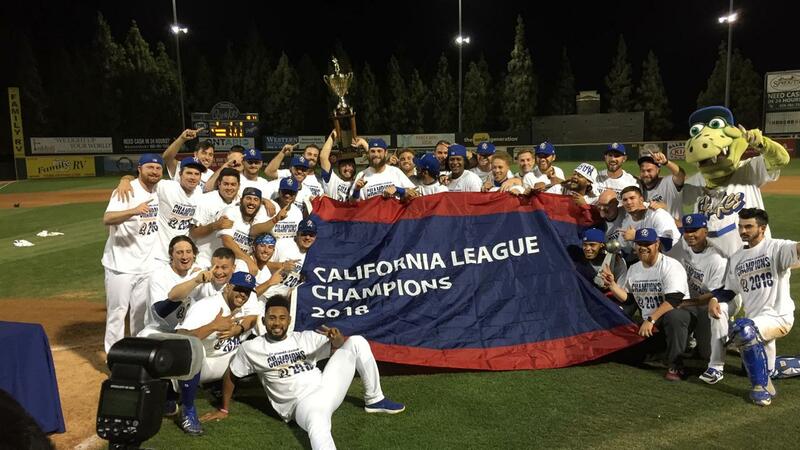 Donovan Casey had four hits and four RBIs and series-MVP Cristian Santana homered for the second straight game, as the Quakes clinched their second title in four years. Rancho Cucamonga starter Isaac Anderson (1-0) was incredible in the clincher, as he allowed one hit over six scoreless innings, striking out six in earning the win. Santana's homer was complimented by Nick Yarnall, Casey and Jeren Kendall, who all went deep for the high-powered Rancho offense, which led the league in home runs in the regular season with a franchise record 202. Dodger rehabbers John Axford, Tony Cingrani and Yimi Garcia combined for 2 2/3 innings, before Parker Curry, who starred in the Division Series in Lancaster and earned the game-one win in Visalia, got the last out, starting the first celebration of a championship in their home ballpark since 1994, when the Quakes beat the Modesto A's at The Epicenter. The title is the second in the Dodgers/Quakes partnership, with the other coming in 2015, when the Quakes swept the San Jose Giants. Santana finished 1-for-4 on Friday night, but totaled four hits in 13 at-bats in the series, with four RBIs to go along with his two home runs. The Quakes would like to thank their fans, corporate partners, season ticket holders, staff and players and coaches for an amazing season. We can't wait to celebrate with you throughout the offseason and look forward to seeing you again at LoanMart Field. Go Quakes!